“It’s just a lodge” said my Be Welcome guide, Claudio as he saw me off on at Chanty Beach for my boat transfer from Madagascar’s Nosy Be (Big Island) to neighbouring Nosy Sakatia and Sakatia Lodge, so I wasn’t expecting much- a version of the small lodge I had left perhaps, with dive facilities tacked on. Claudio clearly hadn’t visited. Sprawling among the trees and subtropical shrubbery, Sakatia Lodge has 33 rooms, beautiful gardens which strike a nice balance between manicured and au naturel, two spacious beachfront villas and airy dining and lounging areas. I was there mainly for the diving, but could just as easily have sat in a deck chair, admired the view across the water and enjoyed the friendly atmosphere. I was there for many other things, as it turned out- great hospitality, great food and the best rhum arrange I’ve had. I enjoyed this potent aperitif on La Reunion, Mauritius, in the Seychelles- and make it at home too, but Sakatia’s chocolate, ginger and tamarind blend is tops (so far). Their Mangosteen stem rum is not too bad either- and I really don’t like bog standard rum. Promise. I was also there for a fair bit of walking- a guided tour past the local village and breadfruit plantation, through the forest with its endemic traveller palms, huge mango trees and ylang ylang to the highest lookout points. Lemurs were curious observers and giant panther chameleons were a delight. 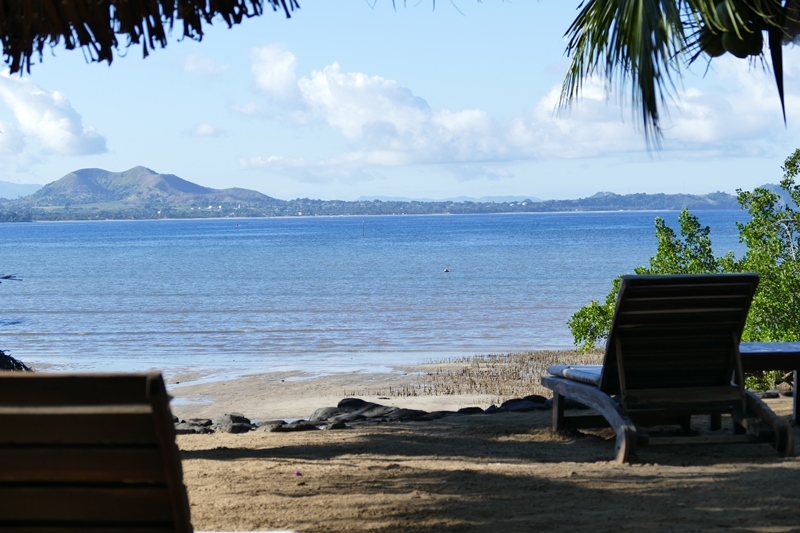 Then it was back down to the shoreline and along the lovely, arcing beach past the local village to the lodge, nestled at the foot of a densely forested sacred- and off limits- mountain that juts out into the sea above the nearest reef. Owner managed and run, everyone is hands-on at unpretentious Sakatia. Jacques and Sandra Vieira, Jacque’s dad Jose and his wife Isabella, Lappies and his son Jody, Edith who oversees the food- all offered plenty of insight into life on Nosy Sakatia and Nosy Be. Jacques and Jose Vieira are passionate about diving and conservation. Jacques, who runs the dive centre, is great with people and inspires confidence in newbie divers, of which I was one. He is widely known and respected and Sakatia Lodge is often the final stop for those experiencing the wonders of MadagasCaT’s boat based, week long (or longer) adventures. The lodge offers every sort of dive course and a highlight is night-time Fluo (fluorescent) diving- the only Fluo diving available in Madagascar. Reefs in superb condition are close by, the nearest within a hundred metres of the beachfront lodge. For my introductory dive I didn’t even don a wetsuit, though for deeper dives, even in water temperatures touching 30C, you do need. How good is the diving? Well, I was with a jaded, dyspeptic dive magazine editor who really wasn’t looking forward to it all. Sakatia changed his tune and he said “Put this in your article: If you are a diver you should put the islands on your bucket list”. The lodge’s dive centre is excellent and it’s good to know that a helivac to a decompression chamber is available if needed. If you’re not diving, a swim or snorkel will still reward you with a huge variety of beautiful reef fishes and other marine life, colourful corals and waving nudibranchs and, very often, the companionship of green turtles. They are around most of the year and you’re also likely to spot them as you sit, drink in hand, on shore. The accommodation is very comfortable. I was in the cheapest option, one of four Mango Bungalows- simple rooms with an ethnic feel tucked away in the trees closest to the mountain. No aircon- and power shuts down in the wee hours- but cool stone and cement floors, fans and shutters in my palm thatched room made for comfortable nights. Four larger Ravinala Bungalows are higher up, and haveoy lovely views over the sea towards Nosy Be. I had a squiz at the three bedroomed villas, Villa Tonga Soa and Villa Ranomasy, a home from home for families or groups with a prime location above the beach. Also suitable for families is the two bedroom Madiro Bungalow – one bedroom with a double bed and two singles in the other – which a lovely veranda above the sandy beach amongst the trees next to the mountain. There’s the Zebu Zen Centre if you need to further unwind and align with the universe. There’s wi-fi if you need to share your unwinding. I’m told South Africans are the most frequent visitors, although that was not my experience. Nationalities mingled, rosy cheeked from the sun, the rhum arrange and high spirits in general. Small wonder Sakatia Lodge is one of the area’s perennial favourites.